SD cards are available in various capacities. Capacity of the SD cards may be 8 MB, 16 MB, 32 MB, 64 MB, 128 MB, 256 MB, 512 MB, 1 GB, 2 GB, 4 GB, 6 GB, 8 GB, and 16 GB etc. 2. SD cards are physically thicker and generally measure 32 mm × 24 mm × 2.1 mm. 3. The contacts are recessed beneath the surface of the card protecting the contacts. 4. SD cards typically have higher data transfer rates. 5. 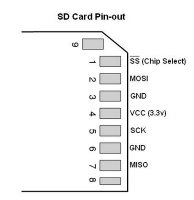 Devices with SD slots can use the thinner MMCs, but the standard SD cards will not fit into the thinner MMC slots. 6. SD cards can be used in Compact Flash or PC card slots with an adapter. 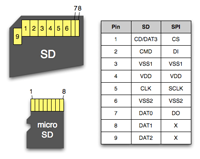 Mini SD and Micro SD cards can be used directly in SD slots with a physical interface adapter. All memory cards must support all three modes, except for microSD where SPI is optional. The cards must also support clock frequencies of up to 25 MHz for regular cards, and 50 MHz for high-speed cards.